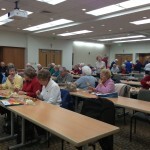 Dr. Philip Riley presented “How’s your Heart? 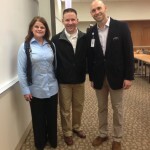 The Importance of Cardiovascular Screening” today at the Mercy Hospital Northwest Arkansas’ Community Luncheon. Dr. Riley spoke to the crowd about the Mercy Heart and Vascular Center, which offers the latest in diagnostics and treatment options with offices in Rogers and Bella Vista. Mercy Medical Center is the first Chest Pain Center in Benton County to achieve the highest possible accreditation from the Society of Chest Pain Centers—Accreditation with PCI. 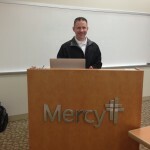 The next community luncheon will be March 13 at noon in the Mercy Hospital Auditorium and will feature Dr. Lindley Diacon presenting “Detecting and Preventing Osteoporosis.” The Mercy Community Luncheons are free to the community with lunch provided. To attend, please RSVP to Melissa.chasteen@mercy.net or by calling 479.338.2907.